Feeling full of uck, muck, and yuck? Oftentimes strange things are afoot at the Circle K (please tell me you’ve seen Bill & Ted’s Excellent Adventure). Instead of plunking ourselves down in these swampy sensations, this is when we most need our yogic tools to set us free. This meditation, as well as any conscious attention to your breath, works miracles in helping us rise above. Hands may be pressed together at the heart in Anjali Mudra (see cute stick yogini above) or rested on the knees in Gyan Mudra. Close your eyes and turn them softly upward to your third eye/brow point. Inhale, watching the breath without trying to change it. Feel it filling you up from navel to brow. Exhale, and let it all go. Release anything that doesn’t serve your highest you. Continue inhaling and exhaling naturally. Breathe in light; you are unbounded and luminous. begin with practicing for 3 minutes. 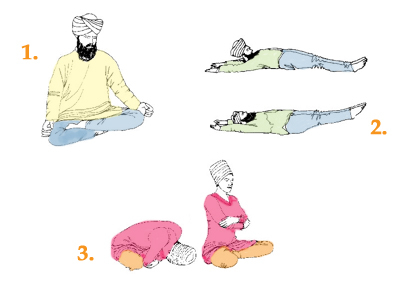 Yogi Bhajan recommended anywhere from 3 to 62 minutes for this meditation. practice in silence so you can focus on your breath. 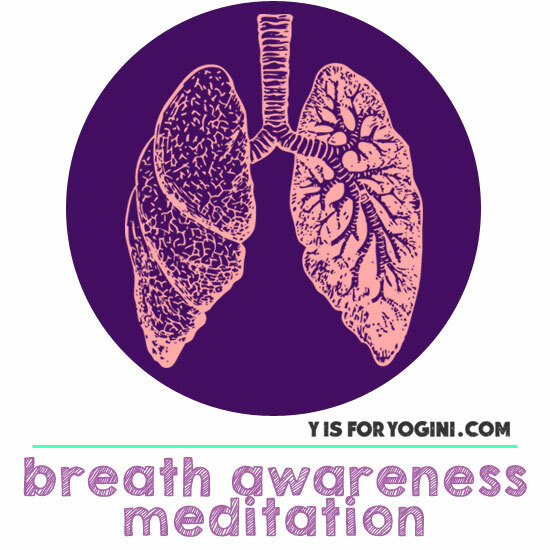 Breath Awareness Meditation as written above © Y is for Yogini, adapted from the original meditation created by Yogi Bhajan. You’ll experience a vast transformation if you practice this for 40 days, but if you can’t, just do what is possible. Meditations are always there for you to pick up (for 1 day or 100) whenever you need them. If you have any questions or thoughts to share, I’m here for you. I was hoping you’d do a new kriya soon.. I assume there are no worries about everyone doing this? I think i will start this tomorrow! xo.. gotta get my connection and glow on! Your stick yogini is a masterpiece! Yes, let go of anything that doesn’t serve your highest you. I say this in pretty much every class. The stick-figure yogini is such a hoot!! :D Love it! Breathing in…breathing out! Given that turbulent times are ahead for me, now seems like a really good time to start this! Loo – You should be good to go. If you get tired sitting upright (or it’s too much pressure on le bebe), prop a bolster or pillows against your wall and lean back into them for support. Jane – awesome! let me know if you have questions and how it goes! Smriti – if i know anything about you, it’s that you take everything in stride with ballsiness and humor. that amazing quality plus this meditation = magic. xo!